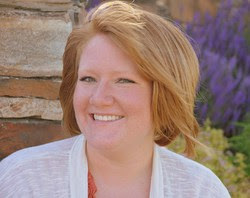 emily malloy: Valentines and My list of "quilts to do!" Valentines and My list of "quilts to do!" This year I fell in love. I fell in love with the fabric line "First Crush" from Sweetwater Fabric. I love all their fabric lines, and I always want to make something with them. 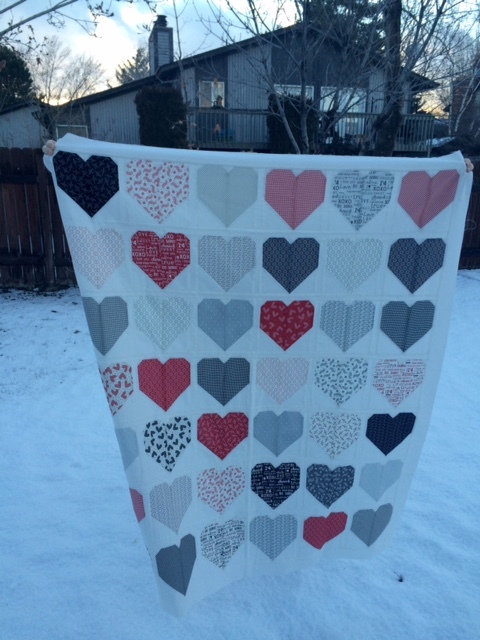 I had been contemplating making a heart quilt this year and when I saw that line last fall I knew it was time! I picked up a layer cake from my favorite Etsy seller Olie and Evie. I'm pretty lucky that Rhonda lives really close to me! I can drive over on Wednesday nights when she opens her house to local shoppers. She's so sweet and has the best price on fabric around. Its fantastic! Like so many others, I used the heart tutorial from Cluck Cluck Sew and it turned out perfect! Pardon the very blue picture. Its wintery and cold and really hard to get pictures these days. I absolutely LOVE how it turned out. It isn't very large, if I'm remembering right, I ended up going with the 7 inch sized block. I'm thinking that I'm going to use pinky for the back so its a perfect snuggly blanket for cold Februarys. My favorite part of this project was the amount of left over fabric I ended up with! I was able to make a super adorable table runner as well as THREE throw pillows for my entry way! HOW ADORABLE IS THAT?! The heart pillows are about 18x18 and they are made out of 2.5 inch squares. The smaller pillow is just strips. The table runner was so fun to put together! I love that it graduates from dark to light. I've never done something like that before. I just have to talk about this little ham for a minute. She is so spunky and hilarious. We just started potty training and she is doing SO GOOD! I can't even believe my little baby is becoming such a big girl! Okay, so this post has gotten just a little long so I think I'll talk about my sewing goals for this year next time. Have a lovely day and sew something! So so cute! Great job! I love your comments! Thank you!